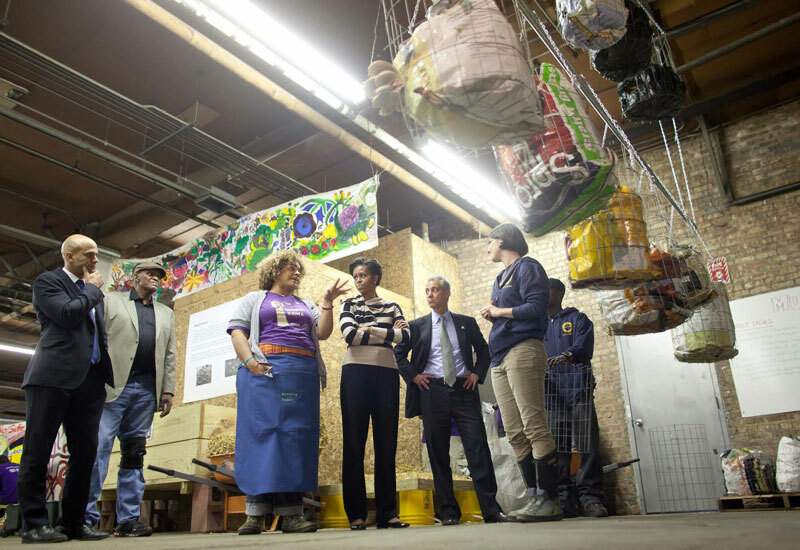 First Lady Michelle Obama tours Iron Street Farms in Chicago in 2011 along with Mayor Rahm Emanuel. A food desert can be defined as a community that has limited access to affordable and nutritious foods. That includes neighborhoods that have a limited amount of chain grocery stores or communities that don’t have easy access to grocery stores. Food deserts lack food providers with nutritious foods such as fruits and vegetables, and instead, provide processed foods filled with sugar and fat. In turn, the community is faced with a health risk of not being able to lead a wholesome lifestyle. The study of food deserts become important when this health risk is presented. According to research by the National Minority Quality Forum, in one Chicago zip code (which has been labeled a food desert), 45 percent to 55 percent of the residents suffer from stage 2 chronic kidney disease. The study cited that the lack of access to healthy foods is one of the main reasons for the epidemic in addition to the related problems of obesity, poverty, lack of access to health care and unaffordable health insurance. In addition to the health risks of food deserts present, they also present an issue of possible inequality. A number of researchers such as the National Minority Quality Forum and the Gallagher Group have conducted a study on food deserts in Chicago and have determined that they exist mainly in communities of color, creating a civil rights issue. In 2006, the Gallagher Group concluded that the majority African American communities in Chicago have the lowest access to chain grocery stores, independent and smaller grocery stores, and all grocery stores in general. However, food deserts exist throughout Chicago in both black, Latino and white communities. Paul Morello, manager of Public Relations at the Greater Food Depository in Chicago, said “there is not a community in Cook County that isn’t impacted by hunger and by food insecurity. We do see higher levels of need on the West side and on the South side, but, the reality is, every single community is facing some level of food insecurity”. Morello explained how Evanston, a traditionally very affluent community, is one of the Greater Food Depository’s priorities. Although it may be a little more hidden or not as quite evident, Morello states that the Greater Food Depository has a number of programs in Evanston to help fight food insecurity in the area. The positive news regarding Chicago food deserts is that a number of people are making an effort to help. In September 2017, a new state law was passed that requires Illinois to track food deserts. Although this is a small step with little help in completely stopping the issue, collecting the data and creating awareness on the problem is a step in the right direction. “Generally, the more information you have about where the need is and where the gaps in grocery retail and emergency food assistance coverage are, the better.” Morello said, “There’s always opportunity to learn from the community and where the need is, and by knowing where to target our response, we’re going to be able to serve more people”. The obvious solution to the food desert problem is to open more supermarkets and grocery stores in struggling areas. The Gallagher Group report states that this has happened to some extent. For example, Food 4 Less, a full-service grocery store, opened in Englewood in 2006 and was only the second full-service grocer within a nine-square mile area at that time. In February 2011, Save-A-Lot, a discount, a limited assortment grocery retailer, announced the opening of five new stores in Chicago’s South Side neighborhoods, which will nearly double its presence. In addition, the company, which is owned by Supervalue, Inc., stated that it will open five more stores by February 2012. Kassandra Hinrichsen at Plant Chicago, which is a 501(c)3 nonprofit organization operating out of The Plant, said the group’s mission is to “develop circular economies of food production, energy conservation and materials reuse; while empowering people of all backgrounds to make their cities healthier and more efficient”. Plant Chicago offers a number of programs to help educate the public on food insecurity in Chicago such as workshops for the general public and 4-12 grade students and tours of the building and speaking engagements on the circular economy. Plant Chicago also has its own farmers market, which is unique because the majority of the vendors grow their own produce inside the building or within the back of the yards neighborhood. They also provide tech workshops in which they demonstrate how you can easily grow your own vegetables and raise your own fish for those who don’t have access to grocery stores. The Greater Chicago Food Depository has its own program called Chicago’s Community Kitchens, which is a 14-week food service job training program for people who are underemployed or unemployed. The goal of the program is to educate the students on how to grill, create proper knife cuts, how to bake and ultimately get these students entry-level jobs in the food service industry. The program is “making sure you have a job is one of the huge factors in fighting hunger,” Morello said. There are many volunteer opportunities available to the public to help Plant Chicago and the Greater Chicago Food Depository fight food insecurity in Chicago. Spreading awareness and educating the public on the hidden thought of hungry people in Chicago is the first step we must take help fight food deserts.